The folks at Generous Giving shared this video today in their email newsletter. The video was put together and originally posted on www.ILikeGiving.com. Their goal is to inspire generous living by sharing stories from folks who give in big or small ways. They ask folks to complete this sentence. It's a good exercise and I think it can help to push us along in impactful generosity. To explain how, I'll answer the question. 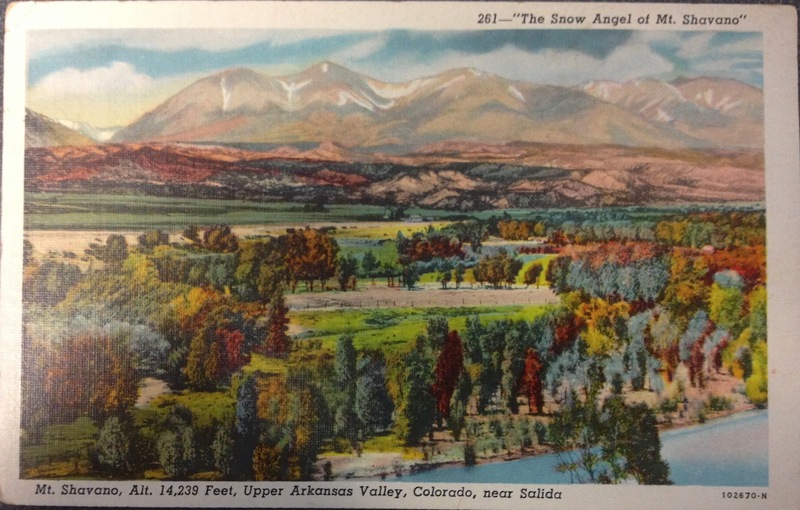 Over the years I have been collecting old postcards of Colorado. Many of the postcards have old hotels, restaurants or landscapes from here in the state. Years ago, when I started collecting them, I planned to use the cards to teach my boys how to make a buck. I thought it would be fun to buy frames and locate the business on the postcard. I figured the boys and I would sell them to the current owner of the establishment, thus raising my boys as business tycoons from an early age. Well, the postcards collected dust and my grand money-making scheme never came to fruition. Finally my wife talked some sense into me. She suggested that I give them away instead of selling them. The first postcard I shared was an image of a historic hotel here in Colorado. I pass this hotel all the time and I had heard of the family that owns it. I stopped in and instead of trying to make a buck, I gave them the old postcard. At first they thought I was a salesman or had some pitch. I told them I just thought it would mean more to them than it did to me. They looked at each other and smiled and then debated back and forth which year it would have been printed based on their renovations over the years. They thanked me profusely and they soon hung the card in the lobby. I couldn’t have paid more than 10 cents for the thing, but in the right hands, that little card meant something. It was fun to take something that was worthless to most folks, and cheap, and to turn it into a meaningful gift to just the right person. I am certainly no alchemist, but without a catalyst, the postcards would never move from worthless to priceless. Old postcards aren’t really that exciting, but I can see other parts of my giving coming alive as I pair my passions with my giving. I bet you have passions that are far more exciting as well. You can become an alchemist. You can engage in giving that is far more meaningful and here’s how. 1. Find something you enjoy and know quite a bit about…your passion. 2. Find a way to bless somebody else using that passion. 1. You will come alive in your giving—By pairing your unique passion with your generosity you will be able to make a unique difference in the world, and enjoy doing it. 2. Others will be thankful—A postcard, worth a dime, can lead to a smile, a story, and a conversation. If being generous with a silly hobby can make a difference, imagine how lives could be changed if you were to unleash your real passions. 3. You will build friendships—Folks are waiting for the sales pitch--they don't expect generosity. You will come alive as you give through your passions, but perhaps even more importantly, your eyes will be open to the needs of others. You will look at what you have and look for folks that need that. In the process you will build meaningful friendships as you truly care for your neighbors. 4. You will raise generous kids—You may have heard the common phrase about educating children, that “attitudes are not taught, they are caught.” It is hard for our children to see the value of giving or tithing or generosity when we cram a check into an envelope and send it off or throw it in the offering plate. When you come alive in your giving, your children are sure to notice. Instead of teaching my boys how to find value and turn it into a profit, I have the perfect chance to teach them about Alchemist Generosity. Hopefully they will catch the bug. Your turn: What are you passionate about? How can you give it away? How can you turn your giving and your passion into Alchemist Generosity?